Will product # 5971 allow HDMI output from an AVR to input coaxial or optical to another AVR? Is to HDMI output and coaxial/optical output 2ch or 5.1ch or both? 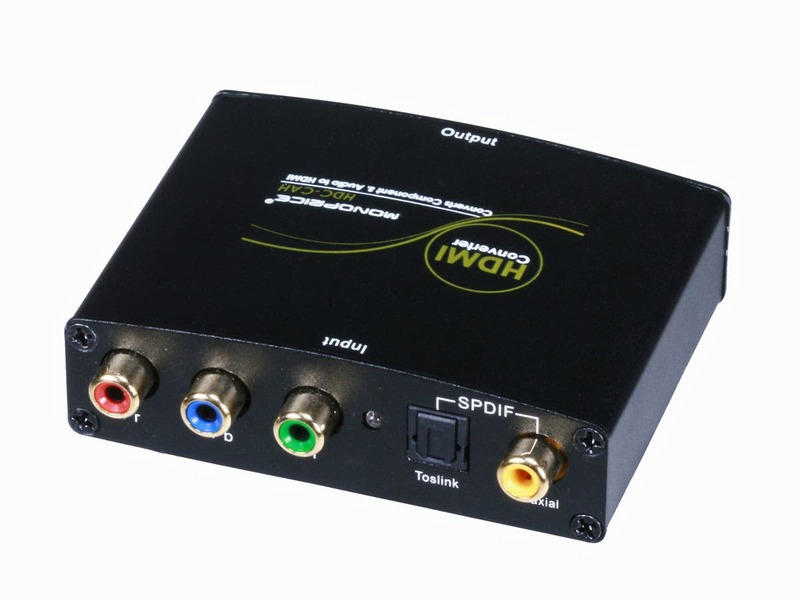 The item #5971 converts and combines the component video signal and the optical audio signal into a one sigle hdmi signal. It will also combine and convert AVR signals into a one single hdmi signal. Optical output with a 5.1 channels will be converted to a 5.1channel signal into hdmi. I can only said that the product works for some video resolutions my JVC projector did not work but the TV did with coxial input to HDMI output.. I did not use the audio because my processor can input the audio for my laser Disc player equipment. No, it will not. It is intended to be used in the other direction. This takes in component and outputs HDMI, not the reverse. I have a Y Cr Cb connection. Is that compatible with a Y Pr Pb connection? BEST ANSWER: There is a difference, Y Cr Cb is the digital version and Y Pr Pb is the analog version, Most displays today will auto sense the input signal and pick the best display settings, If your display was manufactured within the last 10 years you should be OK. Yes, it is simply a different way of representing the naming of that connection. It will work. What is the added latency of using this device? BEST ANSWER: If the device creates latency, it should only be a problem with gaming systems for video. The other issue I could foresee would be auio delay as the device will not support auto lip sync over HDMI because of the Analog to Digital conversion. We use this to connect an older DVD changer by Sony so we don’t notice any latency. Not sure what one would see if trying to connect gaming systems through this device. For the DVD it works great! I have a new Samsung 2160p TV that only has HDMI ports and an older Magnavox DVD/VHS Recorder that has the red green and blue port Will this converter allow me to connect them so I can use my DVD Recorder? BEST ANSWER: As long as you have an optical or digital coax out out from your DVD player for sound, yes. (Which you likely do.) I buy these for the same purpose. Does this product also convert composite signals as well as component signals into HDMI? BEST ANSWER: No. Only component signals inputs are on this unit. No, but they do make a composite to HDMI converter. my application is:I need to attach HDMI output from a cable settop box to the converter input and then RCA plug composite video/audio out to a slingbox. This seems to be opposite the design. Can it work? Anyone doing this? BEST ANSWER: That won't work. You need a converter with HDMI input and VGA or RGB/YRB output. You are correct that this is the opposite. Does this device work both ways? I have a calibrated 2001 Mitsubishi TV WS-55807 with a 1080i component input. I need a device that will accept the HDMI signal from my DirecTV Genie (client) and output 1080i Component Video to the TV. BEST ANSWER: With regards to your question this item does not work in both direction. This will only take a component input and output HDMI. My monoprice component to vga finally gave way this week. I was looking at this and I am wondering if anyone who owns this have ever tested this with a Playstation 2 and hooked up to a monitor that has HDMI support? I know it says it has no scaling function so I assume it is a straight 480p. However, I am not sure if my monitor will do some magical auto-adjust like it does in the VGA side (I experienced an issue with a component to vga that had no scaler) and it caused painful issues for it. So if someone who owns this or perhaps a monoprice tech staff can answer this question it would be appreciated. BEST ANSWER: Thank you for your question. Sorry to hear about the Component to VGA going out on you. Should it be within warranty, feel free to reach out to us regarding replacement options. 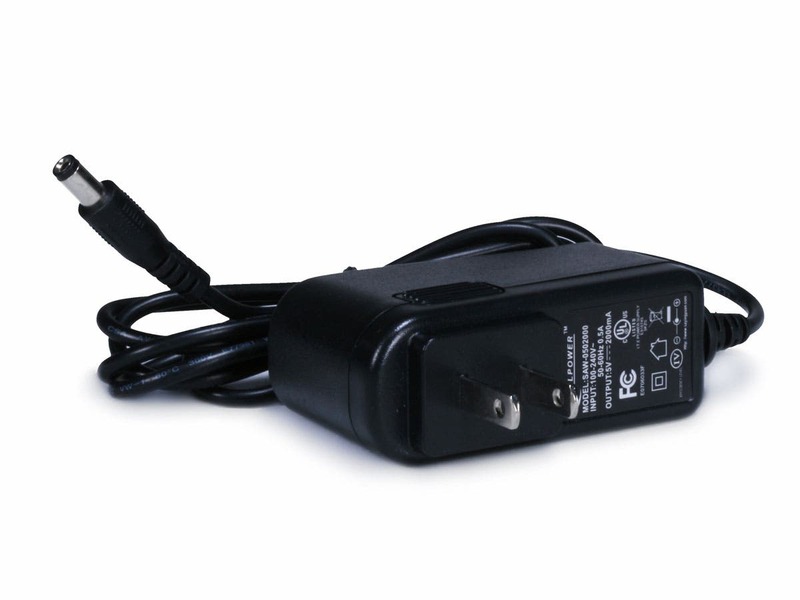 As for the Component to HDMI converter, it should work no problem using the HDMI port on your monitor. HDMI will use EDID information to provide the supported resolutions. It would choose the highest resolution that the PS2 would output via Component. Can I assume that based on specs provided, this will not support 240p resolution? Trying to convert my Sega Genesis and Super Nintendo to HDMI from Component, but the systems will only work if the converter supports 240p. BEST ANSWER: This unit will not support 240p. Will this device modulate audio to HDMI withOUT any video present? BEST ANSWER: No..there must be an video signal, any video signal, as the audio is inserted between the video frames.. Does this device come with a power connector? BEST ANSWER: Mine came with a power cord. I have an antenna on my roof with coax going from the roof to a closet in the living room. From the closet, an HDMI cable is run through the wall/ ceiling to the TV. What product do I need to connect my digital TV signal from the coax to the HDMI cable that runs to the TV? Will this unit output audio through HDMI if the optical audio input is the only connection? No component input. I own a 10 year bose system that sits between my cable box ( with composite output) and my TV. Having to replace my cable box that does not have composite how do I convert HDMI to composite so I dont have to replace my Bose? Used product to go from a DVD/VCR combo unit to HDMI. No signal was passed, returned product. Received new product, same issue. The product just doesn't work as intended or described and is useless. My 2018 Samsung Q7 Series QLED 65" has no inputs for analog components to connect a 2008 Yamaha DVD player. 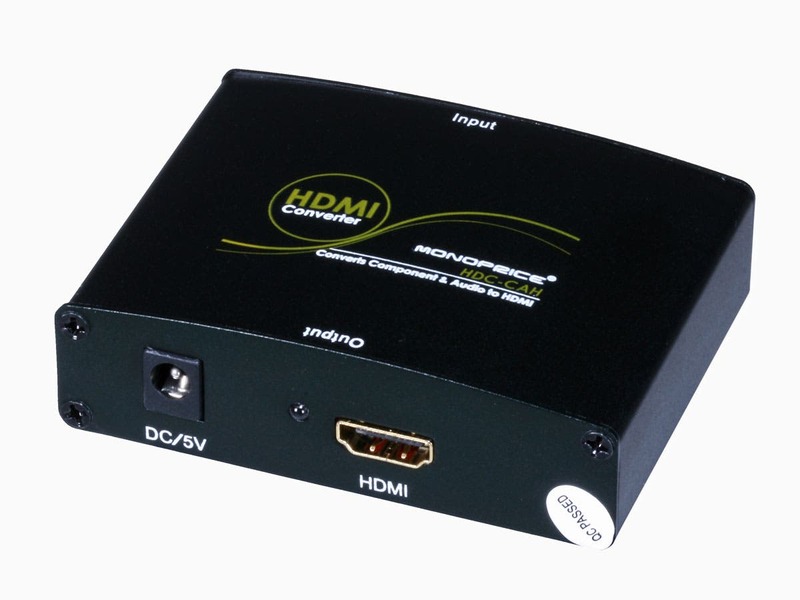 The Monoprice Component & Audio to HDMI converter solves the problem! I'm using the the Toslink for audio. The picture and sound quality is excellent. The value of this conerter is exceptional! Worked perfectly. Allowed me to use my old Hi Def JVC vcr in my system. Audio and video are perfectly in sync. Worth the money. Does not work converting component to HDMI. I get no picture at all. Works as advertised. That's why I love Monoprice products, and will continue to shop with them. High quality, functional products that work! Didnt work, not worth my bother to return. Nice packaging though. Hello, Nathan. Thank you for your review and my apologies for the inconvenient experience faced with this converter. Please feel free to contact us at tech@monoprice.com with your order number and a detailed summary of the issue you are experiencing and our knowledgeable Technical Support staff would be more than happy to assist. Thank you! PROS: Great product, worked like a charm out of the box, packaging of product was professional.